I got up early on day 8 to climb a hill and watch the sunrise. I could have done with a few more hours sleep but I didn’t want to miss seeing the sun rise over Mount Taranaki. This is my camerawork by the way because the official cameraperson refused to get up. As you can see, he missed a … spectacular sunrise. After breakfast we talked to the couple who run the Opunake Beach Holiday Park. I asked them if they were originally from this area. No, we’re from Auckland originally. Um, sick and tired of sitting a queue of traffic going to work. So we thought of something that would be … we could actually both work together, in an industry that was dealing with the public and we came across holiday parks and it’s been very, very rewarding. I think it’s actually just the family environment, just … you see children that have grown up from year to year. They, ah, it’s quite good to see them come back the next year and how they’ve got older and that sort of thing. But just the whole family environment you see the families together and having a good time. You know, it’s just good wholesome fun, I think. Craig and Jenny said they’d been in the industry for ten years. They’ve run parks in Kerikeri and Taumarunui and have run this park for the last three years. I asked Jenny what she liked about this area. She said their quietest months are June and July. There aren’t many tourists around in winter, but the park doesn’t close. No, we don’t close, we’re always open. Because there’s always someone around, you know, even … we might have one campervan in the park, it’s still, someone needs somewhere to stay, so we are here and open all year round. 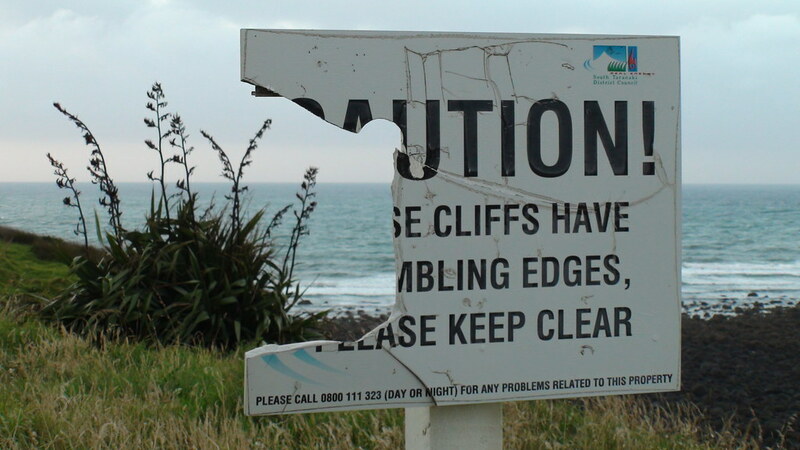 They told us about the Opunake Beach Carnival that was on that day. It wasn’t starting until later on in the morning, so we thought we’d go and do some sightseeing and come back for the carnival. Mount Taranaki looked so beautiful. There was a little bit of snow on the mountain. I thought it looked like a person reaching for something. We decided to go and check out a place called Parihaka. I wasn’t exactly sure where it was, but we eventually found it after stopping and knocking on a few doors to ask people. Hundreds of Māori used to live in a village here in the 1800s. They were part of a peaceful movement which promoted non-violent action to protect Māori independence. The Parihaka movement was led by Te Whiti o Rongomai and Tohu Kākahi. In 1881, Tohu and Te Whiti were arrested and jailed by the Pākehā government and most of the village was destroyed. People say it’s one of the most shameful episodes of New Zealand history. There’s still a marae here today and I stayed here for a few days 27 years ago when my family came for a gathering to celebrate the autumn equinox. This is me in 1984 when I was 5. I vaguely remember the pōwhiri and lots of singing. 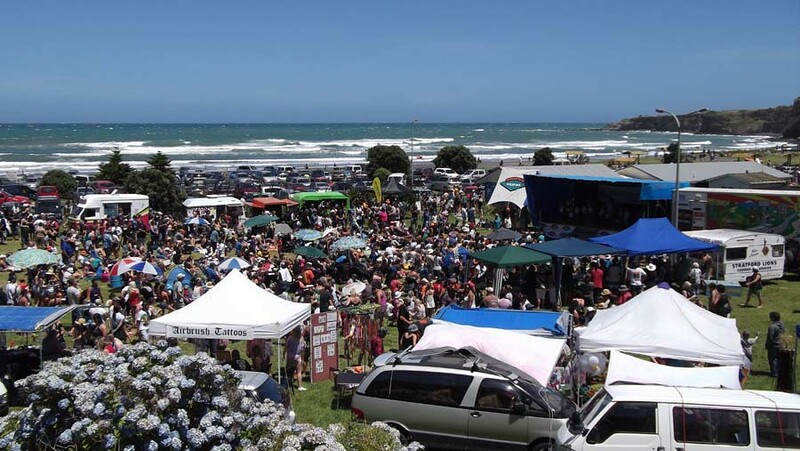 After Parihaka, we went back to Opunake to check out the Opunake Beach Carnival. The place was packed. And people seemed to be enjoying watching the beauty contests. Ooh! Now, we got some big support. And hi there, what’s your name? Hi Dylan, anyone you want to say hello to? Shot. Hi Mum! That’s from Dylan. Man, these guys are serious. These guys are looking for the title. They’re going hard out. Oh Kazan, you’re going nuts. Tyson, mean. Wicked. Now let’s go for the lat spread. There we go. Flex those arms, show those lat muscles. Numer 6, g’day, what’s your name? Madison. And where are you from, Madison? Inglewood. And what brings you here today? Ooh, you’ve got some Inglewood supporters. Geez, you’ve got some noisy friends. And first place, Miss Junior Opunake 10-12 years … number 26! I bought a lucky dip for $2. I used to love buying these when I was a kid. I got a bag full of cute little things. Stamp. Glow-in-the-dark butterfly. I also did the coconut shy. You pay $3 for four throws and if you knock a coconut off you get to keep it. Unfortunately, I didn’t knock any coconuts off. I was very disappointed. The cameraperson was disappointed with my throwing style. Apparently you’re supposed to move your wrist as well as your arm. Who knew? We stopped for a coffee in a little town called Patea and I bought a postcard. We also checked out the waka which in the video of the famous New Zealand song Poi E.
It says here this was erected in 1933. I posted today’s postcard in a town called Waverly. 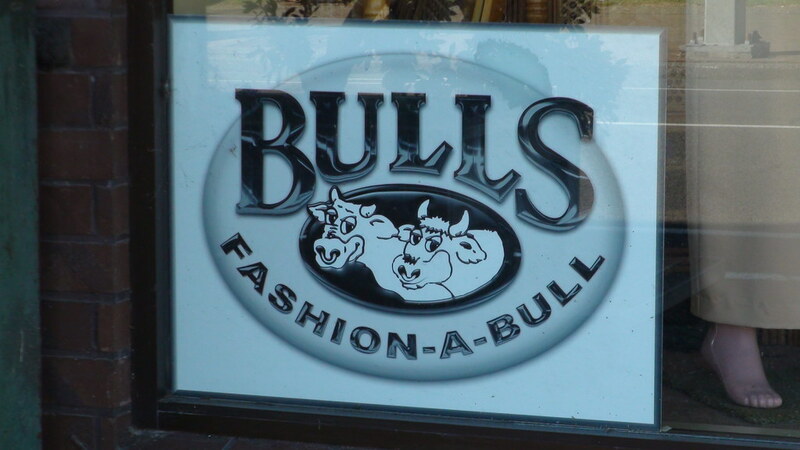 Coming up is Bulls, an extremely repute-a-bull (reputable) small town. 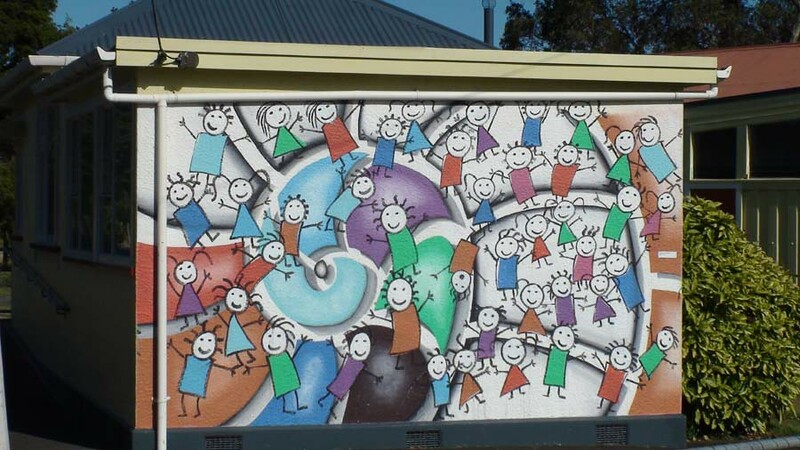 Here you will amongst find a plethora of colourful murals, an all-pervading bull theme, with more than 100 intriguing signs that play on the place name, like the medical centre, cure-a-bull. We stopped in Bulls to take some photos of the signs. 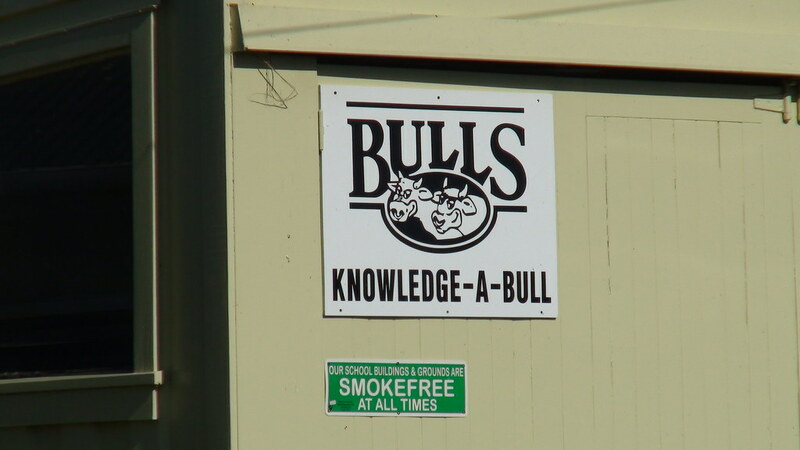 The school has a sign saying knowledge-a-bull. 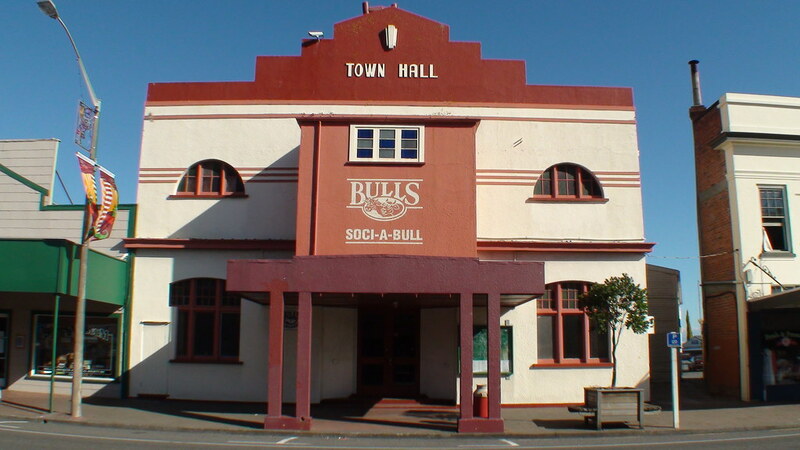 The town hall has soci-a-bull. 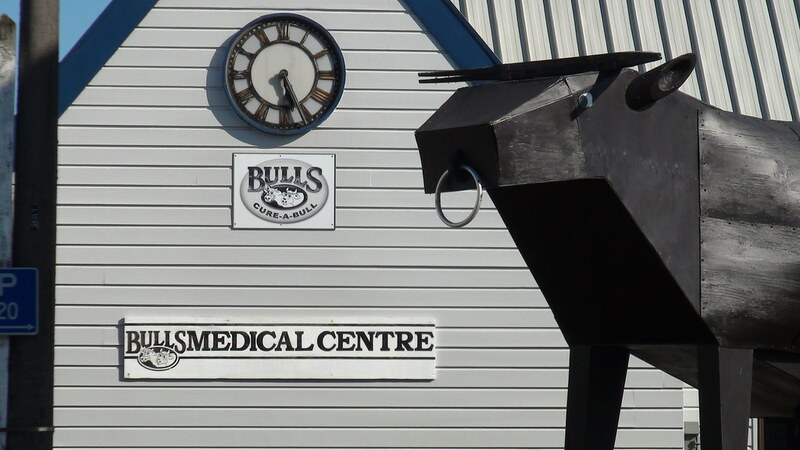 The medical centre, cure-a-bull. 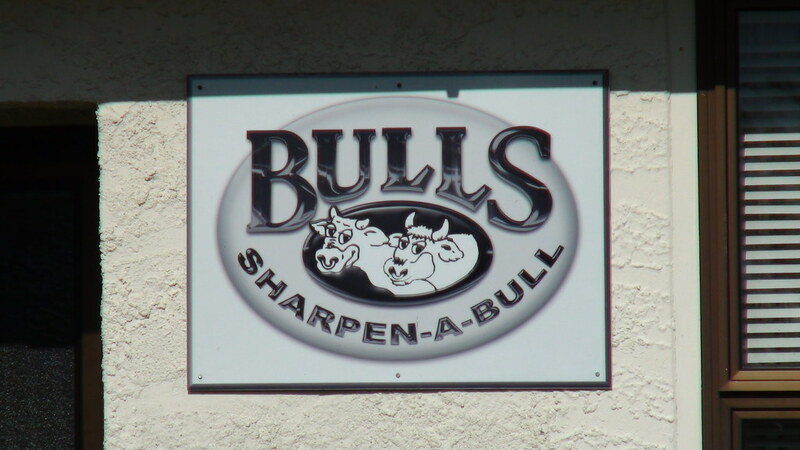 There’s also live-a-bull, bloom-a-bulls, sharpen-a-bull, fashion-a-bull. 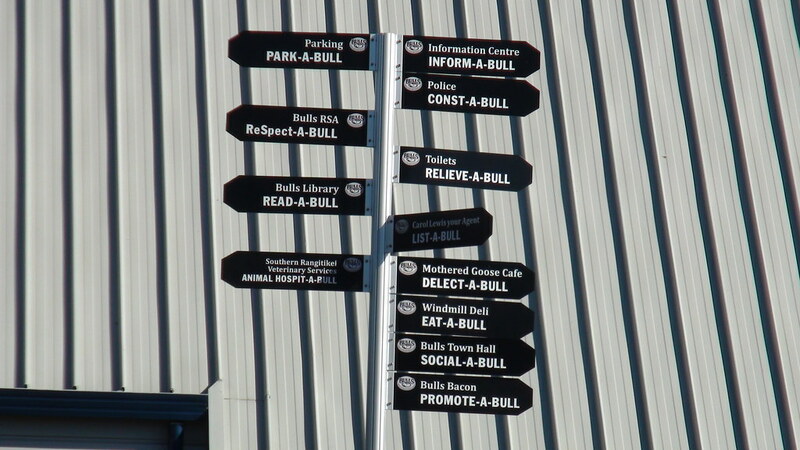 Park-a-bull, respect-a-bull, read-a-bull. OK, I think that’s enough.You get the idea. That night we stayed with some friends in a city called Palmerston North and had a delicious Japanese meal.